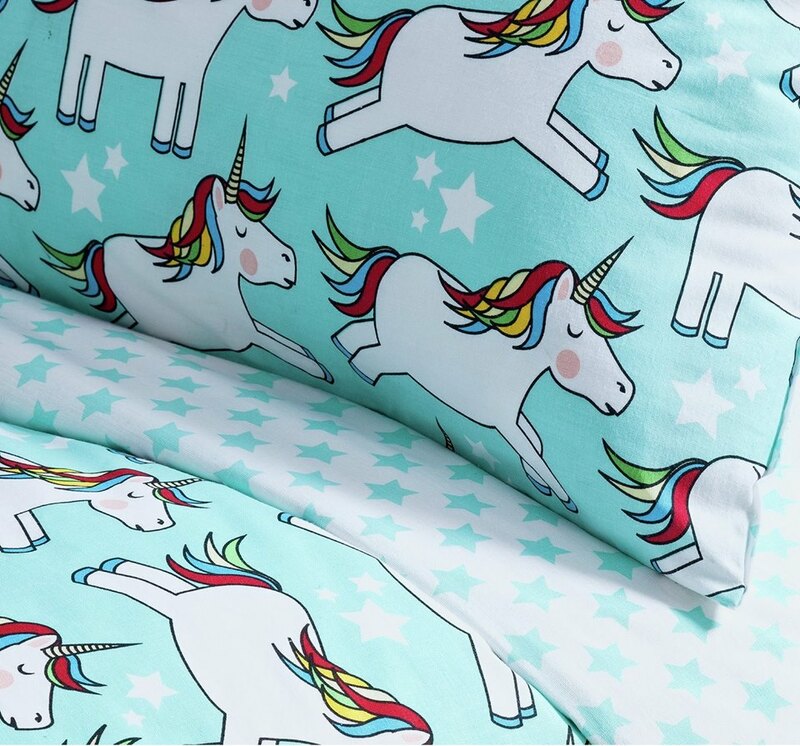 If your little angel loves all things unicorn then you have to show them this wonderful unicorn bedding from Argos! Not only is it a gorgeous bright fun design it’s also an absolute bargain too! There’s a toddler set reduced to just £4.99 down from £8.99, and the single is now just £5.99 down from £11.99! 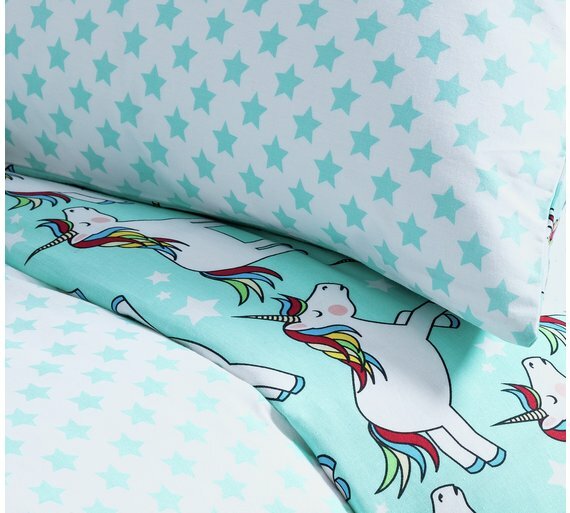 Both sets feature a repeating pattern of cute unicorn with his eyes shut looking sleepy as he leaps across the duvet, complete with rainbow mane and tail. The sets are reversible so that you can flip them over for a starry pattern when you fancy a change. They’re made from a polyester and cotton mix to make them easy to care for, and they are machine washable and can be tumble dried. 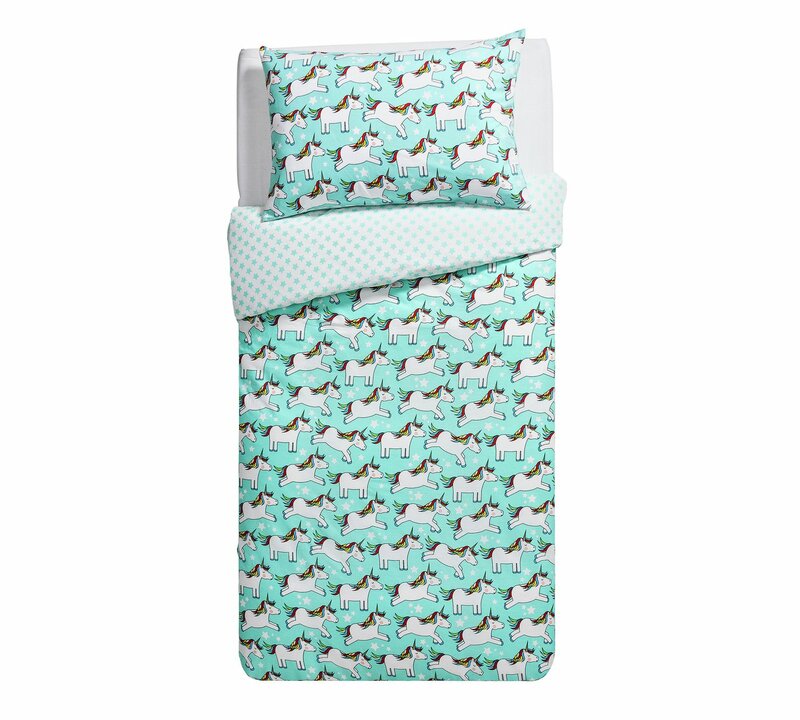 Add a dose of unicorn fun to their bed with this whimsical single bedding set from the ARGOS HOME range. With a repeat unicorn design, this gorgeous and magical animal is looking sleepy himself. He has his eyes tightly shut – so he’s sure to encourage the little ones to drop off to the land of nod too! His gorgeous rainbow coloured mane and tail add some fun colour to the blue background. For a completely different, but equally gorgeous look, you can turn the duvet cover over for a starry night design that is perfect for creating a space for them to snooze. Set comprises of 1 duvet cover and 1 pillowcase. I’m willing to bet that they will sell fast at this price. Reserve and collect is free of charge, or home delivery costs £3.95.